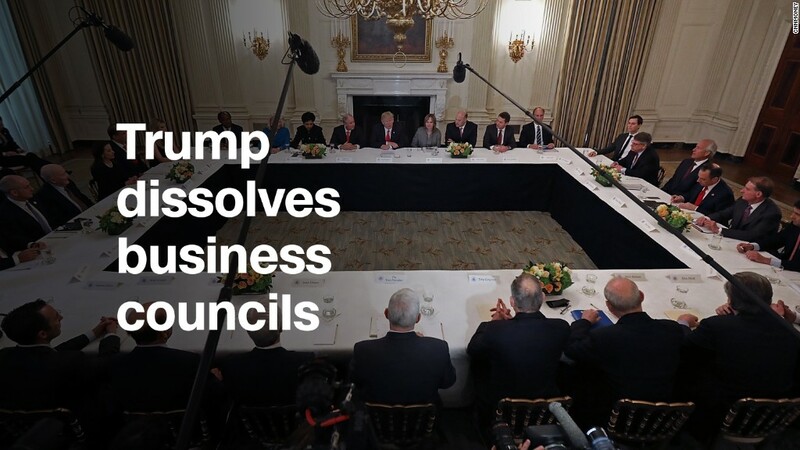 President Trump's two business councils were already on shaky ground Wednesday. By early afternoon, both had fallen apart. "Rather than putting pressure on the businesspeople of the Manufacturing Council & Strategy & Policy Forum, I am ending both," Trump tweeted at 1:14 p.m. ET "Thank you all!" The Twitter announcement marked a stunning collapse for the two panels, the Manufacturing Jobs Initiative and the Strategic and Policy Forum. Trump hoped the two would help advise him on jobs and the economy. The CEOs of Tesla (TSLA), Disney (DIS) and Uber had already abandoned the groups earlier this year over policy disagreements with Trump. But the two councils had largely stayed intact. That started changing early Monday morning when Merck (MRK) CEO Kenneth Frazier abruptly resigned from the manufacturing council. His move came after Trump on Saturday blamed "many sides" for violence at a white nationalist rally in Charlottesville, Virginia. Over the next two days, leaders from Intel (INTC), Under Armour (UA), the Alliance for American Manufacturing, the AFL-CIO, 3M (MMM) and Campbell Soup Company (CPB) also resigned. Trump at first stood firm, even as the backlash intensified. He blasted Frazier less than an hour after the CEO quit the council. And on Tuesday, after others left, he tweeted that he didn't even need them. "For every CEO that drops out of the Manufacturing Council, I have many to take their place," he tweeted at the time. "Grandstanders should not have gone on. JOBS!" It was a bold declaration. But by Wednesday afternoon, Trump had made a stunning about-face. In just over 24 hours, the president went from bragging about his many replacements to taking credit for completely dissolving his two business groups. The story behind the scenes was complicated. While the manufacturing group was publicly coming apart, CEOs on the Strategic and Policy Forum decided to act together. The forum included top talent from General Motors (GM), JPMorgan (JPM), Blackstone (BX) and others. According to three executives with knowledge of the discussions, Trump's startling press conference Tuesday at Trump Tower spurred the members to talk about a response. Trump had doubled down on his position that the violence in Charlottesville was perpetrated by "many sides." Blackstone CEO Steve Schwarzman, the head of the forum, organized a conference call with the members late Wednesday morning, according to the people who spoke to CNNMoney. Most of the CEOs had already decided to leave the group, but on the call they came to a collective decision to dissolve and started drafting a public statement. Schwarzman then called senior White House adviser Jared Kushner to tell him the group was disbanding, according to two of the executives. Trump's tweet came shortly after. The White House did not respond to requests for comment. A statement from the group followed Trump's tweet and said the decision was a mutual one. "The President and we are disbanding the Forum," the statement read. Meanwhile, companies involved with the manufacturing group were releasing statements that distanced themselves from Trump. Leaders of Johnson & Johnson (JNJ) and United Technologies (UTX), two members of that group, were still declaring their resignations. A spokeswoman for Johnson & Johnson told CNNMoney that its CEO, Alex Gorsky, made his decision before Trump's tweet. General Electric (GE) Chairman Jeff Immelt also sought to clarify that he beat Trump to the punch. Immelt was one of the executives on the manufacturing council who had earlier this week said he would stay. But his company released a statement at around 2 p.m. Wednesday that said he had a change of heart. "I notified members of the council this morning that I could no longer serve on the President's Committee on American Manufacturing," Immelt said in a statement to CNNMoney. He called Trump's statements from Tuesday "deeply troubling."